Ever since I saw the interiors of the recently refurbished COSTA ROMANTICA, known today as COSTA neoROMANTICA (CnR) I've been keen to sail on her. I've never been drawn to Costa Cruises as essentially they operate a European version of Carnival Cruise Lines, right down to the same ship designs and interior designer, but surely CnR was going to be something different? I wasn't disappointed. CnR started out as COSTA ROMANTICA in 1993 and along with her near sister COSTA CLASSICA, they were branded under a new Costa upscale division called EuroLuxe Cruises. You might say this was Costa's answer to the Greek shipping company Chandris spinning off its own upscale brand called Celebrity Cruises. No need for much detail as to what happened, but suffice to say there is no longer EuroLuxe Cruises (very short lived) while Celebrity Cruises is thriving under the ownership of Royal Caribbean. The two EuroLuxe ships were quietly retreated back to the Costa Cruises brand and have been happily sailing under Costa ever since. Costa was a very different animal back then, being family owned and operating a range of older and newer vessels that somehow seemed more true to their Italian heritage than the Costa of today. Carnival Corporation acquired a partial stake in Costa and eventually this progressed to full ownership and today Costa operates as a brand under the Carnival Corporation umbrella. Until recently, by any account Costa Cruises would be considered a roaring success. Carnival exploited the need for a Carnival Cruise Lines style of cruising for the European Market, and Costa was the perfect contender. Under Carnival, Costa started building larger and larger mega-ships that are high density, action filled ships that resemble floating Las Vegas hotels not unlike Carnival, their American counterpart. Much to my surprise, the European clientele embraced the flashy American style concept and more and more ships were built. For a time, Costa was the fastest growing brand under the Carnival Corporate umbrella. So how does CnR fit in with this expansion? I don't know all the details but Costa management decided on an experiment. Take the existing COSTA ROMANTICA and transform her into an upscale, boutique style ship that would cater to adults on a worldwide cruising schedule. 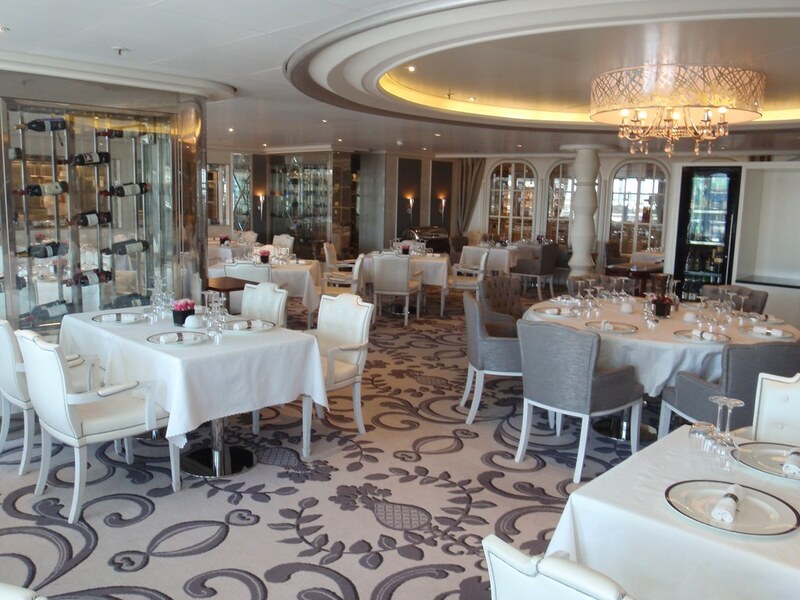 Costa did a fine job on the refurbishment, and the result is a stunning ship that would not be out of place operating for a much more luxury line such as Crystal Cruises. The ship is void of the typical Costa neon and flash, and instead showcases public spaces that are luxurious and contemporary in style. There is no large show lounge, no massive video screens or water slides on deck, no children's pool and in fact children's facilities are almost non-existant except for a small playroom. The onboard atmosphere is low-key which is fitting for such a refined ship, but herein lies the problem. While Costa did a fine job with the refurbishment of the ship, they have fallen short in the marketing required to promote the ship as something unique within their fleet. For this reason the ship receives low scores from Costa passengers expecting Vegas style shows, non-stop action and extensive children's facilities which Costa is known for. It also creates an extra burden on the ship's staff and crew as they deal with disgruntled families that expected something completely different than what CnR offers. Sailing on CnR for me was a blast from the past. She is a "shippy-ship" which simply means that she will be appreciated by anyone that started cruising before 100,000 gt floating mega-resorts with thousands of balconies and features more suited to a land based resort. CnR feels like a ship, from the pleasant ship fragrance right down to her handling in rougher seas. The majority of cabins are void of balconies and instead feature a more traditional but oversized porthole. Two traditional aspects where CnR fails miserably are the lack of a promenade deck and the fact there is no public forward facing viewing deck. Both of these features actually exist on the ship, but they have been designated as crew only areas which is truly unfortunate. This sailing was my 99th cruise, but it many ways it felt like my first. Costa does things quite differently from North American based cruise lines and it took a little getting used to. None of it was bad, just different and I often times found the differences refreshing, and sometimes frustrating. First and foremost I have to give Costa credit for catering to multiple nationalities with a great deal of success. Everything is offered in five different languages and this alone is extremely challenging. On my particular sailing there were only six Americans onboard, and very few English speaking passengers. Perhaps under 100. The vast majority were Italian, followed by French, then German, then Spanish. I could not have been more impressed with the crew of which most spoke multiple languages, perhaps not fluently but enough to get by. One minute they had to interact in German, then French, then Italian, and so on. As an American which tends to be extremely English-centric, I was beyond impressed. I had three primary concerns about Costa before I booked, and they all turned out to non-issues. Multiple announcements in five languages, excessive smoking, and multiple embarkation/disembarkation ports on a single cruise. As it turns out, announcements were kept to a minimum and rarely did you hear one. There may have been five during the entire 11-day voyage. Smoking was no more prevalent than any other cruise I have sailed. Costa handled embarkation and disembarking in the three turnaround ports almost as if they were simply transit ports. There was no extra disruption and you never felt as if hundreds were embarking or disembarking while you simply enjoyed a transit port. Costa knew exactly who was getting on and off in each port, and specific instructions were provided when it's your turn to disembark. There are no announcements and the process is simple. I only wish this style would work in the US but with the CBP requirements it will never happen. We embarked in Rome (Civitavecchia) and it was fairly effortless. Pier side we dropped off our bags, turned over our passports, and showed our cruise ticket. As we walked onboard a picture was taken with a handheld device and we were directed to our cabin. The door was open and inside were our Costa Cards, welcome letters, dining reservation card, and emergency drill cards which are handed in when you attend the mandatory drill. We only had about 6 people at our drill which was held in the meeting room by the English speaking hostess. Your credit card for onboard purchases can be registered at your convenience at any of the Costa "Totems" that are located throughout the ship. I must say it was all very civilized just as disembarkation was 11 days later. Since the CnR was refurbished to a higher standard than the typical Costa ship, there were standard amenities that you would not find on other ships in the fleet. For instance we had Frette robes, slippers, and an umbrella in the cabin. For turndown service a Frette bedside linen was placed on the floor on each side of the bed, something I have only seen on Silversea. Some nights we had handmade Costa chocolates waiting for us as a goodnight snack. The flat panel TV was extra-large and offered full interactive capabilities which were probably the best I've seen on any ship. Unfortunately the selection of English speaking channels were minimal and there were no free movie channels. There was a small selection of on-demand movies that you had to pay for, and I felt this was something that could have been improved upon. Room service was available at no charge in our cabin grade, but it was a minimal selection of cold items only. This is certainly something that seems to be copied from Costa's sister brand Carnival in the US, which also has a minimal cold selection of room service items. We received fresh fruit daily and canapés on a few nights which was a nice touch. As I mentioned earlier Costa caters to multiple languages, so this reflects in the entertainment onboard. It was mostly musical which needs no translation. Since there is no large show lounge there are no large production shows which was fine by me. For me the best entertainment was a superb wine & cheese venue called Enoteca Verona. The selection was fantastic as was the Italian Sommelier. He knew exactly what wines to recommend and paired them with a fantastic selection of fruit & cheese that were complimentary when you purchased a glass of wine. His creations really became the highlight of my evening, and dare I say enjoyed the wine, fruit & cheese far more than the dining room selections. In the dining room we enjoyed a wonderful table for two by the window in a smaller annex at the entry to the main room. The more intimate setting certainly made you feel as though you were sailing on a much smaller ship. We got to know several of our dining room companions in our "private" annex which made the experience that much more enjoyable. Service and food quality were mixed, and my partner actually lost several pounds on this cruise. The menus, preparation, and presentation were definitely more geared to a European clientele. For instance for some fish dishes the entire fish would arrive complete with head and tail. Likewise the shrimp which would arrive with head, feet, and shell in tact. This is just not typical on American based cruise ships and while I personally didn't mind, my partner found very little to eat that he actually enjoyed. Red meat was rarely offered, and when something like a steak was offered, it was of inferior quality than even a low-end steakhouse in the US. I found sticking with pasta was the best bet, and many pasta dishes were quite tasty. Deserts followed the European tradition of being far less rich than an American counterpart. Receiving you salad shortly after the main entree also took a little getting used to. 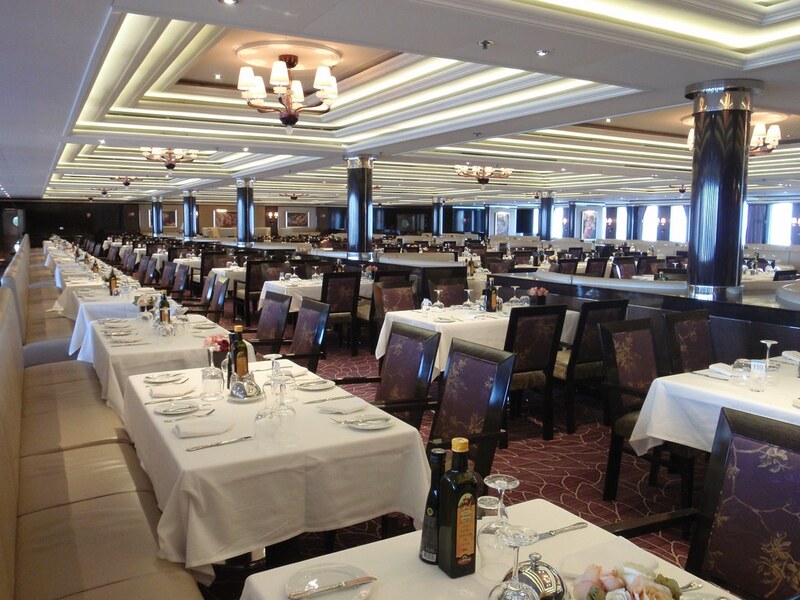 The buffet restaurant followed the same trend as the dining room, and the selection was far less than what you would expect on a US based ship. The times that the buffet was open was also rather limited compared to US based ships, and oddly enough the grill (burgers, etc) was often only open for dinner and not lunch. Not a big loss as Costa probably has the worst burgers I've ever seen or tasted. They were pink in color even though they were fully cooked, and tasted like cardboard. I've never seen anything quite like them, and once was enough. There was also a dedicated pizzeria onboard and the pizza was delicious, but oddly enough again it was only open for dinner and not lunch. Also you had to pay for the pizza which seemed rather odd and petty on an Italian based ship. 7.50 Euros per person. Towards the end of the cruise we were invited to a tour of the galley hosted by the Executive Chef. His name was Adam Lockwood, and funny enough he was from England. A little surprising on an Italian ship and perhaps this helped explain the food situation? It just didn't seem very Italian. Overall we just felt the cuisine lacked variety and quality. Some of that is no doubt due to cultural differences, but having traveled the world and as a person that enjoys a great variety of cuisine, I was disappointed. This is one aspect of the CnR that would prevent me from sailing on her again, at least on an extensive voyage of multiple weeks. 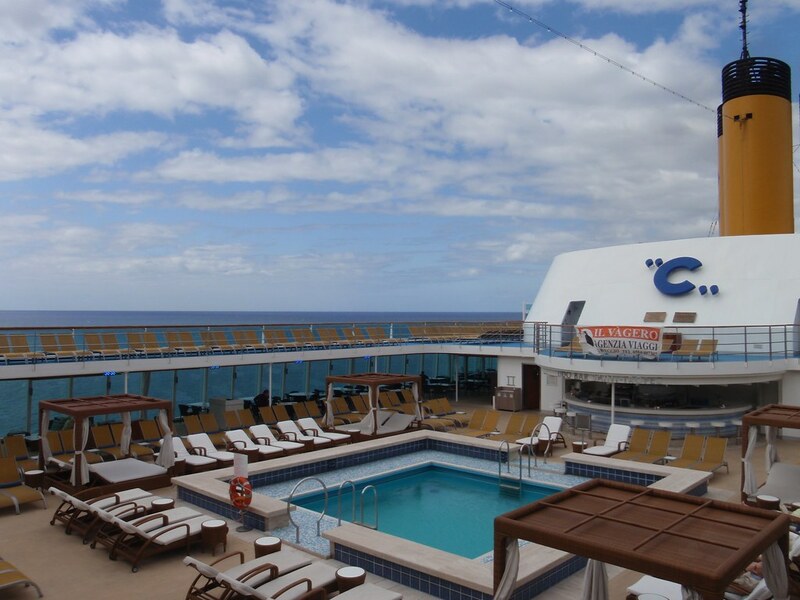 CnR featured a small library & internet cafe, an aft-facing nightclub, a tiny casino by US standards, two ballroom type lounges, and two pools surrounded by adequate deck space. I felt the pool areas were lovely and spacious with comfortable loungers and unlimited towels which was a nice touch. No signing in and out pool towels or having to return them to your cabin. At the very aft of the ship was an adults only deck and bar that featured a jacuzzi. This was a lovely space with luxury outdoor lounging areas and an incredible view. It was quiet and featured its own bar. The fact that children were not permitted provided an extra appeal. Unfortunately there were quite a few kids on this cruise, which frankly the ship wasn't designed to handle. There are no children's pools or facilities except for a small "Squok Club" for the toddlers. The kids had little to do except run rampant throughout the ship. The meeting room was turned into a teen center but it was completely inadequate for the task and Costa really needs to rethink the marketing for this ship. The families were disappointed because the kids had nothing to do, and the adults without children were disappointed because there were kids running all over the ship. I quickly learned that European kids are no different than American kids when left to their own devices. They can be equally if not more obnoxious. The running and screaming down the halls at all hours became tedious, and often times the parents were just behind the kids but ignored the fact that the kids were yelling at the top of their lungs well after midnight. Kids excessively screaming in any language is annoying! This aspect of the experience along with the cuisine that I mentioned earlier were probably the two biggest disappointments of the experience. Special mention must be made of the Samara Spa. I hope you have the opportunity to view the photos I took of this area, because it's truly exceptional. 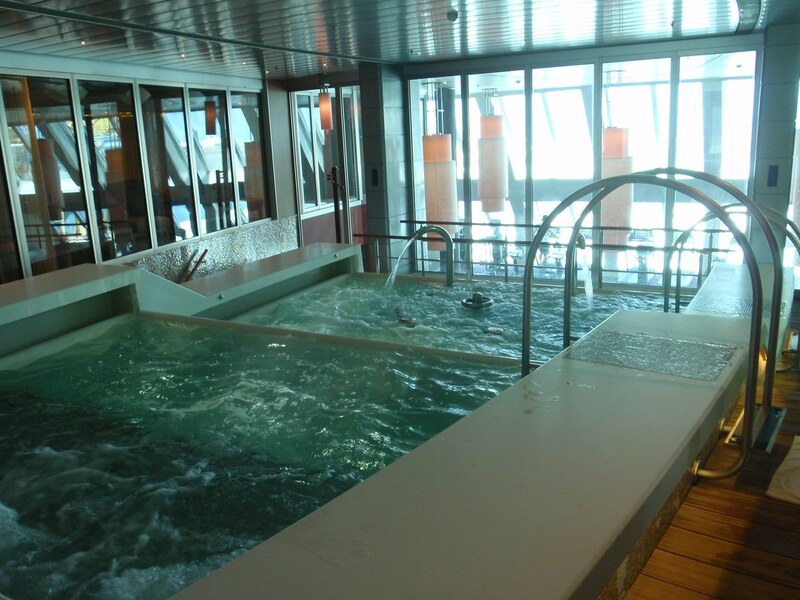 In fact I would say it's the most beautiful and extensive spa I've experienced on any ship. When Costa made the decision to refurbish the COSTA ROMANTICA, they placed a great deal of emphasis on the spa. In fact the forward facing two level show lounge was removed entirely and in its place a multi-level spa with every amenity imaginable. Most of the crew will tell you that CnR is designed around the spa, and I believe it. The problem again is that Costa is not promoting this feature in any special way, so it goes unappreciated and unused by many passengers. Spa revenue is not meeting expectations so the experiment will not be repeated on sister ship COSTA CLASSICA or any other Costa ship for that matter. It's a shame and I feel only Costa itself is to blame. I had unlimited use of the spa and took full advantage of it for a couple hours each day. You are issued a water proof wrist band with an electronic sensor that unlocks all the doors in the spa and gives you full access. Two features I've never seen on any other ship are tanning beds and a cold room which you sit in after the sauna. Another feature I've only seen on QM2 is a foot soak and massager. In addition there are the usual steam and saunas (Thermal Suite), relaxation rooms, a wonderful "tea room" in which various teas are served while you enjoy a beautiful forward facing view, and fitness center and beauty salon. The centerpiece is a fantastic tiered therapy pool with amazing views. My partner and I befriended the Spa Manager Silvio, and we found him to be exceptionally friendly and greatly enjoyed his conversation. It was interesting chatting with him about the various challenges he faces with the multiple nationalities onboard, and also his experience as a crew member on the COSTA CONCORDIA when it struck the rock and capsized. We booked one service in the couples massage room which was lovely, and I greatly enjoyed my first hot stone message. I highly recommend it! Believe it or not we actually visited some ports on this cruise as well. From Rome we sailed to Savona, Barcelona, Casablanca, Funchal, Tenerife, and Malaga. We had pre-booked a few tours online before the cruise, and all were canceled except for one because of not enough English speaking participants. Credits for the canceled tours were applied to our onboard account. We didn't mind because generally we enjoy doing things on our own, but it's a warning for those that like to plan ahead. Don't count on your Costa arranged tour actually operating and you won't find out until the day before that it's canceled. This makes it difficult for people that like to plan everything out, and may be another reason to cross Costa off your list if you are English speaking and enjoy organized tours. I would recommend booking a reputable 3rd party tour operator that will guarantee operation of the tour. Casablanca was the only stop where we really felt the impact, as generally it's not a city you want to explore on your own and the best bet is to get out of the city altogether. We were offered a tour to Marrakech in English as a replacement, but spending 13 hours on a tour where over 10 hours is spent on a bus was not appealing to us. Many of our ports offered hop-on, hop-off bus tours and this is an excellent and inexpensive way to sightsee. We really enjoyed Funchal as well as Malaga, where we ventured to the beautiful seaside resort of Marbella. I would be happy to return to either of these cities for a more lengthly visit. Of course you can never go wrong with Barcelona and as usual we greatly enjoyed this charming city. There were so many aspects of this trip that we really enjoyed, but several that missed the mark as well. While I loved the COSTA neoROMANTICA itself, certain aspects of the software such as the cuisine were disappointing. 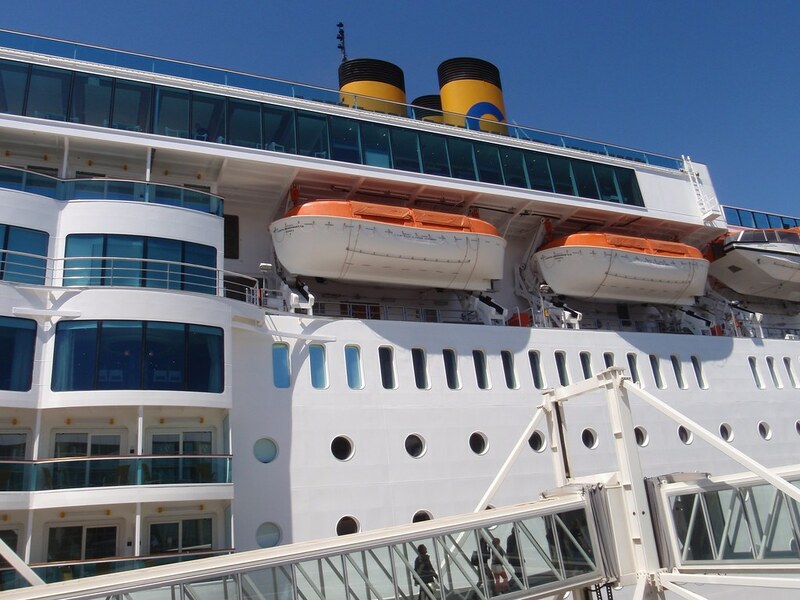 Experiencing the different style in which Costa operates compared to US based cruise lines was mostly enjoyable, but some components could be frustrating such as the tours being canceled and understanding exactly how things are done. Once you figured it out all was good, but getting to that point could be challenging at times. I truly hope to see Costa figure out how to successfully market CnR in a way that benefits her style and design, but for now she seems lost in a fleet that she is generally not compatible with. I don't see myself sailing on any Costa mega-ships in the future, as I might as well just cruise on Carnival, but I would love to return to the CnR given the right circumstances. I'm happy to entertain any questions you may have, and please enjoy the extensive photos at the link below.